You know what really makes San Diego Comic-Con great? It’s not the big announcements (although those are exciting), or watching actors goof around during panels (although that can be fun). It’s when the one of the thousands of fans shares a special moment with the creators and performers they admire. During the question and answer session of The 100 panel, one young fan got up to the mic in front of hundreds of people in the San Diego Convention Center’s Ballroom 20 to ask her question to several cast members and show creator Jason Rothenberg. “I can’t believe I’m talking to you,” she told the panel. The girl started to fan herself. “I’m going to start crying,” she warned them. “Aww,” one of the panelists replied. “We’re going to start crying.” At that, the girl’s face scrunched into happy and anxious tears. 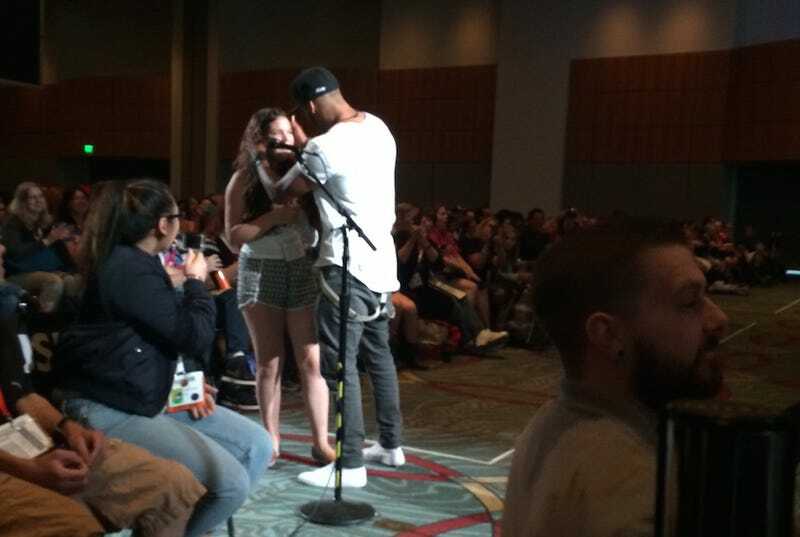 A sympathetic murmur swept through the room and Ricky Whittle, who plays Lincoln, shot out of his seat, jogged down the stairs, and extended his arms to the teary-eyed girl. She nodded and stepped into his embrace, and we all got to see her share a tender moment with an actor from her favorite show. Whittle left his arm on her shoulder as she caught her breath and started speaking into the microphone again. Sometimes it’s hard for me to remember that Comic-Con is a fan event. But it’s the fans that give this place real emotional weight, and remind me amidst all the hype that pop culture has real power.